Goldbaby Essentials was one of the first Add-ons we ever released for Studio One, and it’s remained a mainstay of our catalog ever since. And it’s on sale for 30% off in January 2018! If you’re looking to get your 808 on without shelling out $3,500 on ebay—and don’t forget that a MIDI-sync mod will run you for another couple hundred—this is the right pack for you at less than 1/100th of the price. But drum machines don’t begin and end with X0X kick drums, so the exclusive Goldbaby Essentials Soundset for Impact features a whopping 500 samples from beatboxes of yore, arranged into 32 Impact drum kit presets and 124 new musicloops. This collection is very different than that no-name drum machine sample collection you regrettably BitTorrented a while back. You know the one I’m talking about: rife with clipping, inconsistent filenames, and varied sample rates. You got what you didn’t pay for. Goldbaby Essentials has been meticulously, professionally sampled by a real pro, and processed with warm, saturated, real-analog-tape-saturated goodness. 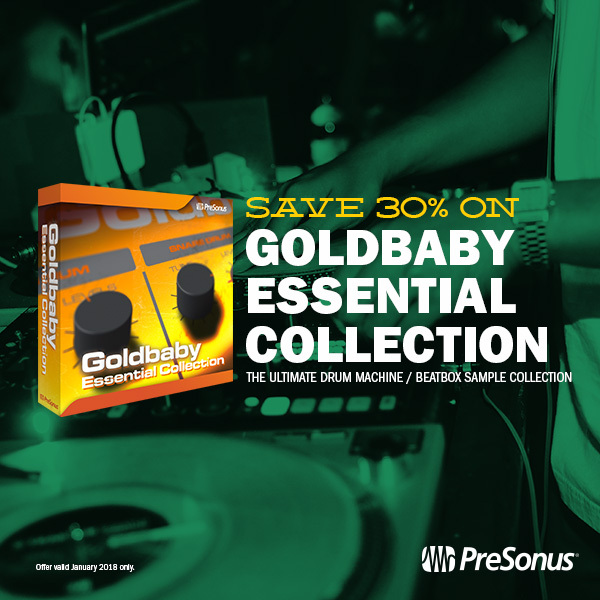 Add to that the money, space, and time you’re saving when compared to buying all those drum machines and sampling them yourself—and you can’t deny that Goldbaby Essentials is even better than the real thing(s). You can purchase and download Goldbaby Essentials by clicking here.